We all awoke with a bad taste in our mouths from the terrible loss last night, but since it’s New Year’s Eve, we brushed our hands off. We had a lazy morning, and then Pappy, Papa Rod, Uncle D, Matt, Chloe, Cole, and I decided to treat ourselves to Mexican for lunch – and to ease the pain. Then, we loaded up the kids and sent them to the lake with Pappy and Papa. 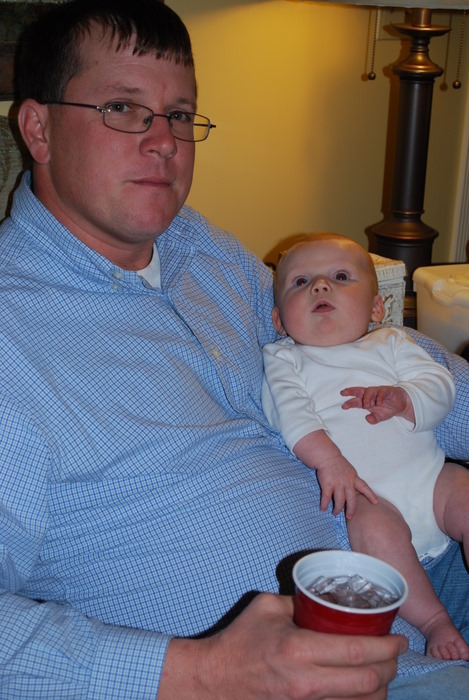 Uncle D came home with us and we had a lazy afternoon of football and naps. And since our kids were gone, we were ready to hit the town. 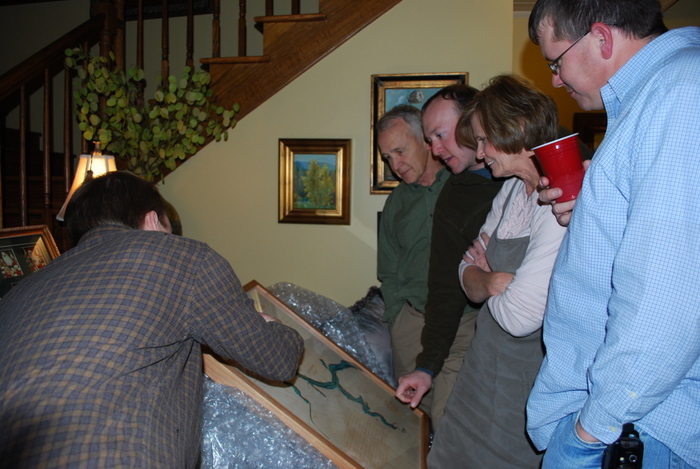 We started the night off with the dear Ross family along with the Glasgows, Schriners, and Sarah and Will (not sure of their last names). 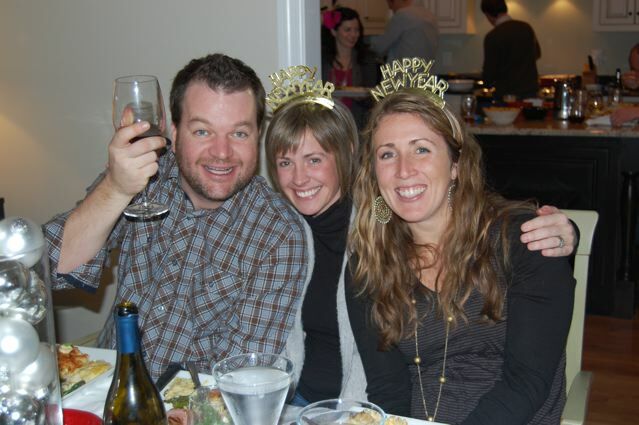 It was a great time of great food, great wine, and great friends. I forgot my camera, so I’m just using the pics Courtney emailed me. I think my best laugh of the night was Matt and A. D. sitting at the “kid table” and me squeezing in between Noel and Heather and making them as uncomfortable as possible. 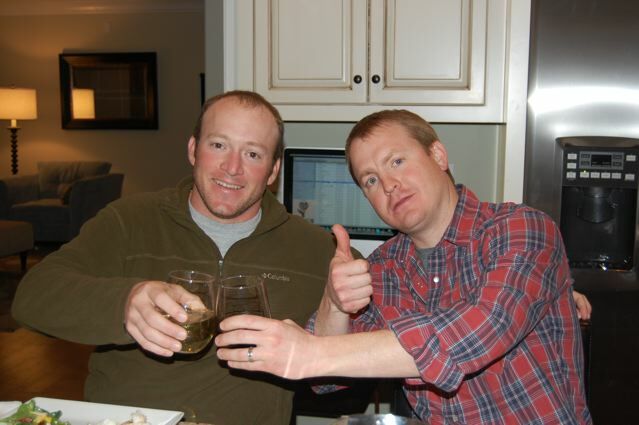 We were then escorted by the police (Mitch) to the Ryman to see Old Crow. That was also a fun experience. I’ve never been in the back of a cop car, and they sure do make it as uncomfortable as they possibly can for you. Mitch dropped us off at the Ryman, and it was a great show. Old Crow played until well after midnight, so when the show was over we walked to Broadway to catch a cab. That’s when the night took a turn. We COULD NOT find a cab. The sidewalks were filled with people also trying to catch a cab. And, did I mention that it was storming? Freezing, raining, thundering, lightning, windy…. and we were just standing in the middle of it soaking wet with half of Nashville trying to catch a cab. Finally, I waved one down, opened the door to hop in, and this couple pushed me out of the way and hopped in!! It was unbelievable! We ended up calling Mitch (again) and he saved the day for us. 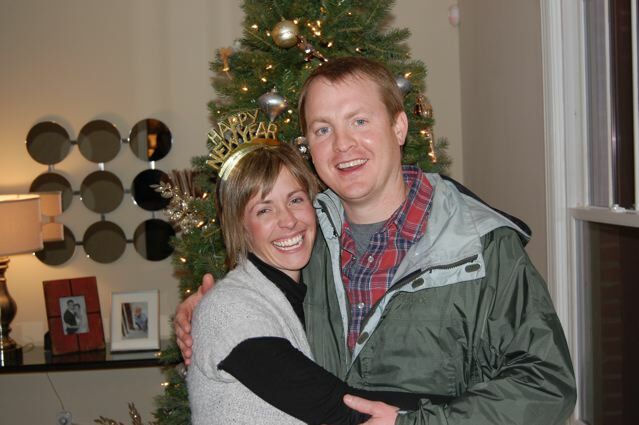 He picked us up in his cop car because he was still on duty, drove us to switch to his other car, then drove us home….. only to find that we were locked out of the house because our garage door opener was in our car at Courtney and Jason’s house. Once again, Mitch saved the day and got us into the house. We owe him BIG TIME. It was three o’clock before we got into the house, and I do NOT do 3:00. I’ll repeat, I DO NOT DO 3:00. Matt, A. D., and I all threw our soaking wet clothes in a heap on the floor and went straight to bed. I do not remember ever being that cold, wet, tired, and miserable! But, it was a great night up until the looking-for-a-cab part of the night. The next day, we slept really late, and for lunch we cooked cheese grits, collard greens, black eyed peas, corn bread, and I put A. D. in charge of the hog jowl. GROSS! I did manage to take one bite for health (if that’s not an oxymoron! ), but that’s all I could get down. Since the kids were at Pappy and Papa’s, the rest of the day was spent lounging around and watching football. A. D. left late afternoon, so Matt and I had a date night and went out for some good Italian. Tomorrow after church, we’re picking up the kids. We’re already excited to see them! My Christmas tree plus all the Christmas decorations were taken down the day we got home. I couldn’t wait to get it all back in the garage so I could get my house back in shape. 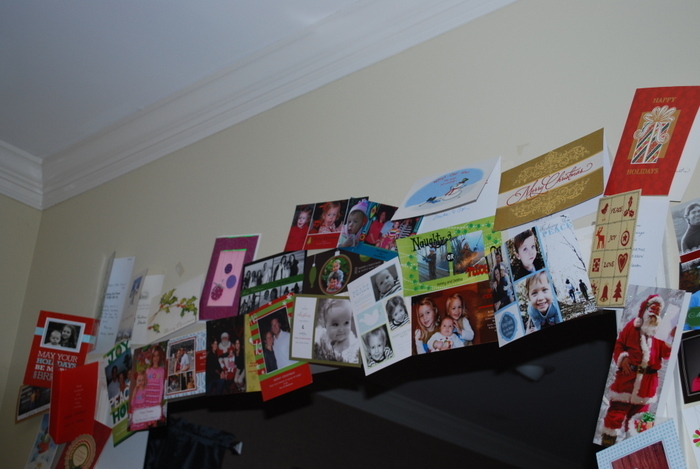 My Christmas cards, though, are all still hanging. It’s time to take them down, but it is one of my favorite things about Christmas. It’s like getting a present in the mail everyday during the month of December. 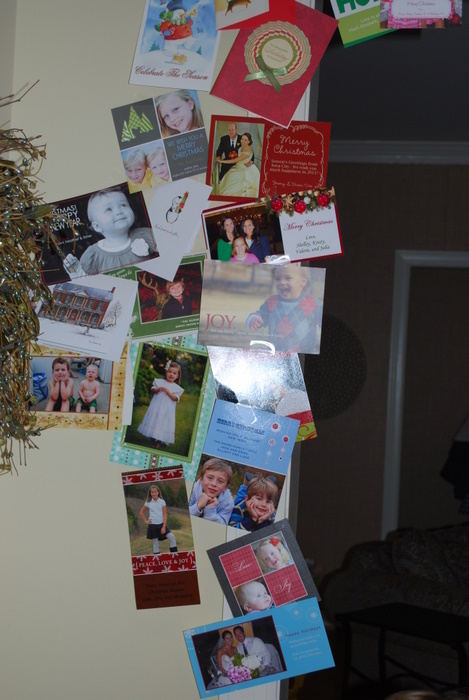 I love running to the mailbox in December, and if Matt ever beats me to it, he knows not to open any Christmas cards. It’s just the best reading all the messages and seeing all the faces of my friends and family, especially those that we don’t see very often. 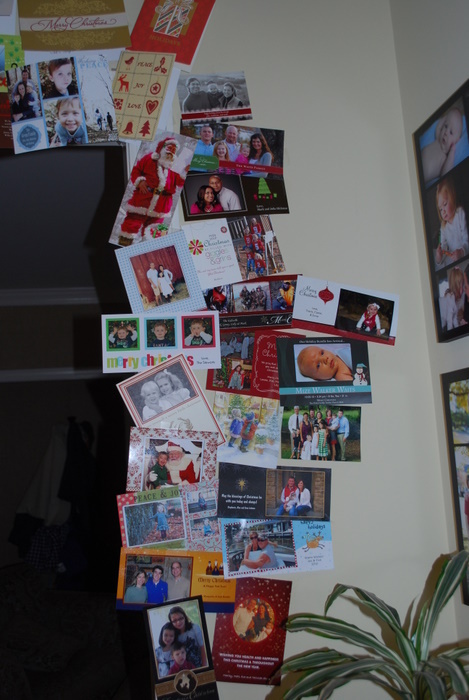 I’m always sad after Christmas when there is not a stack of cards in the mailbox. The day started off so well. Pappy and Papa spent the night and Uncle D arrived at lunch. We sent the kids to Ninnie’s and then we headed to tailgate. It was such a beautiful day, but it was a bit windy. The first bad thing that happened was that Carrie and Ryan had to cancel. Layla ended up getting really sick, so they stayed at home with her. I was so sad. We had been looking forward to them coming for so long. Such disappointment! But, we had fun tailgating even though Mom and I were the only females. Finally, some girls showed up! I was happy to see Niki, Erin, and Lacey. We tailgated most of the afternoon and made to the stadium in time to watch the Vols run through the “T.” It was as if we were at a home game – all orange, and despite the ending of the game, we really did have a lot of fun. 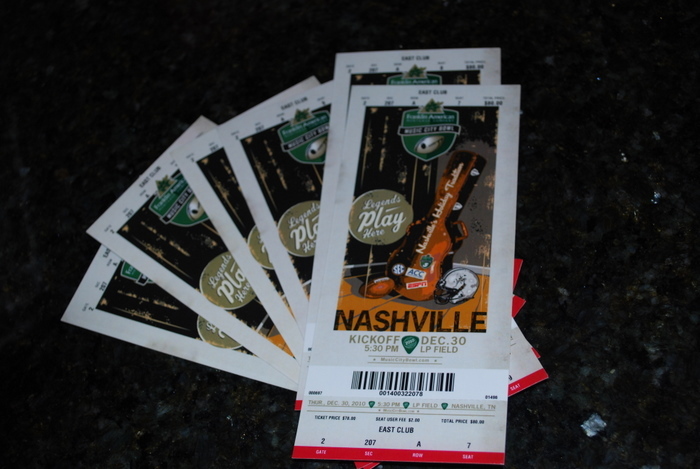 Our seats were GREAT, and we had a lot of fun cheering on the Vols. I won’t even go into how the game ended – and I don’t think we will ever forget that terrible loss to UNC – so I will just leave it at us having a great time. We love our Vols and Dooley no matter what, and it’s still sad that our season is over no matter the heartbreak. 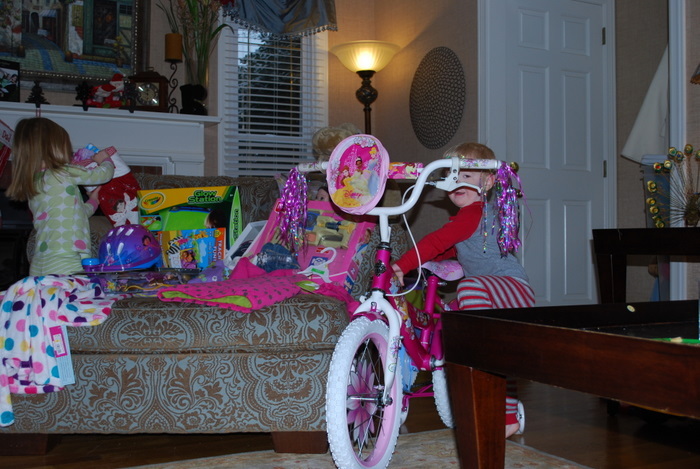 After spending a few days with Pappy and Papa Rod, Chloe was ready to get back home to play with her new toys from Santa. 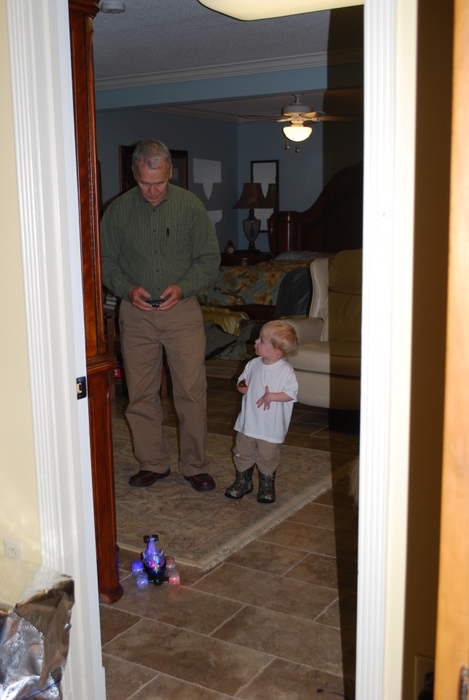 Since we’ve been home, this is usually how we find Cole…. 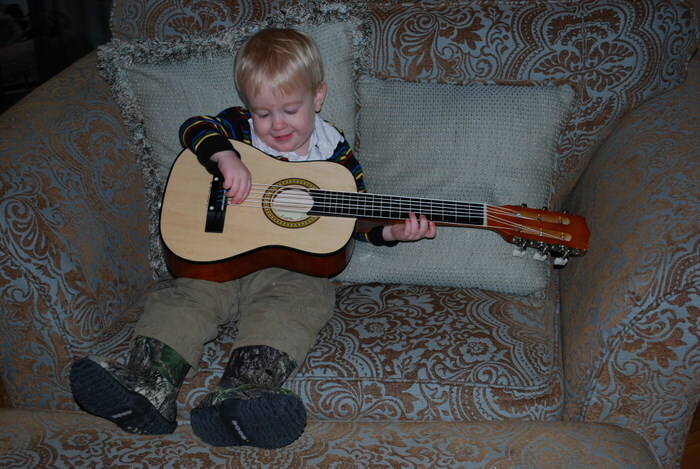 in his new boots strummin’ his new guitar. And, the boots still aren’t coming off. As soon as he wakes in the morning, he finds his boots and puts them on with his pj’s. 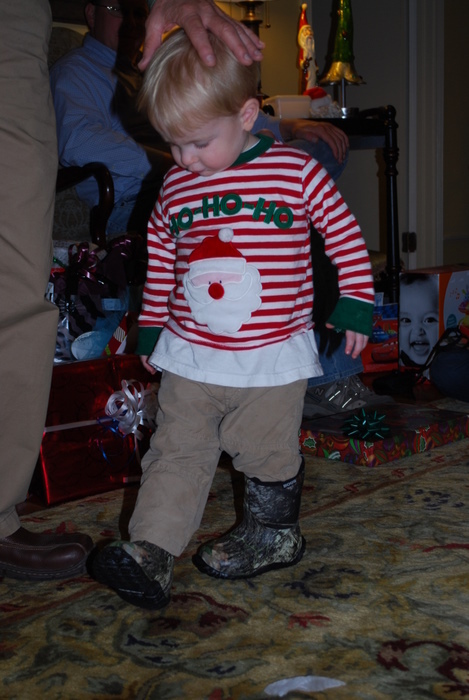 I’m already worried about how I am going to get him to wear anything other than the boots to school or church! 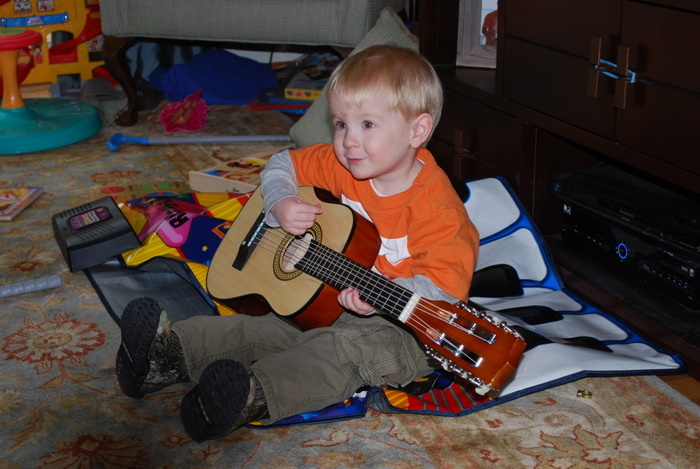 Maybe he’ll be the next Jimi Hendrix or Waylon Jennings. He sure looks more the part of Waylon. 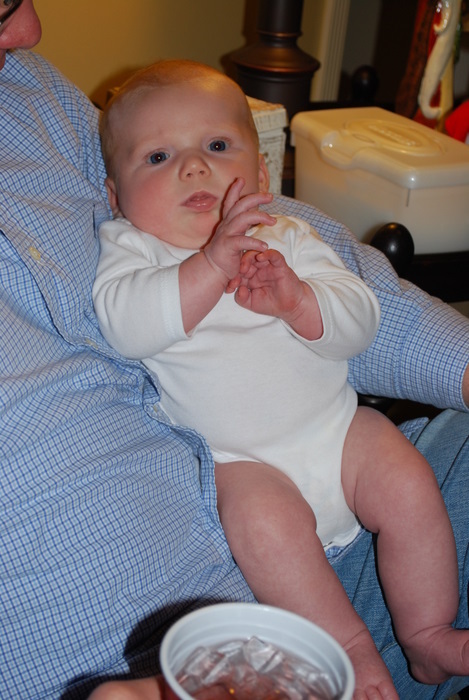 We made a quick trip to Pappy and Papa’s house and were there by 4:00. Chloe slept maybe 30 minutes, but Cole didn’t sleep a wink. We were all excited to get out of the car and be at Pappy and Papa’s. 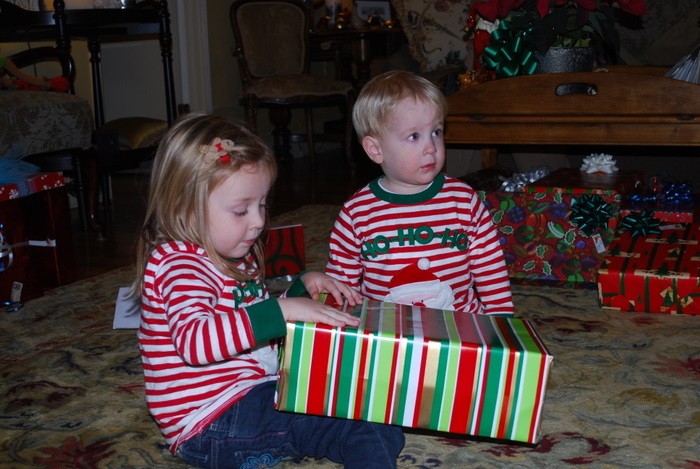 By this point, Chloe and Cole had the “Christmas thing” down pat and knew there were presents awaiting them. 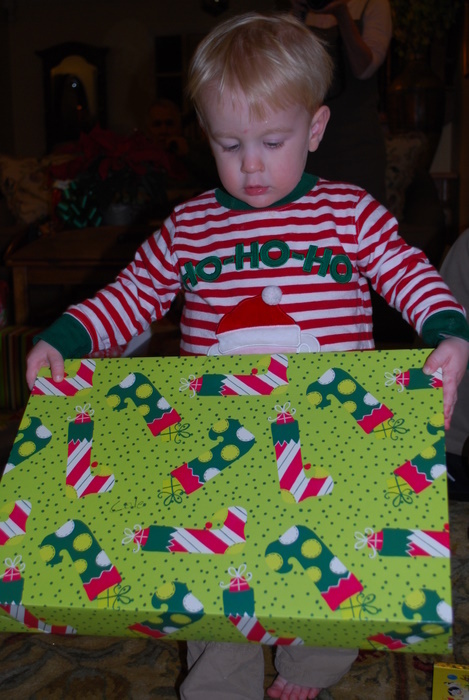 We had to wait on Austin, Danie, and Mize for a while because they were finishing Christmas w/ Danie’s family. It was almost too much for Chloe to take. 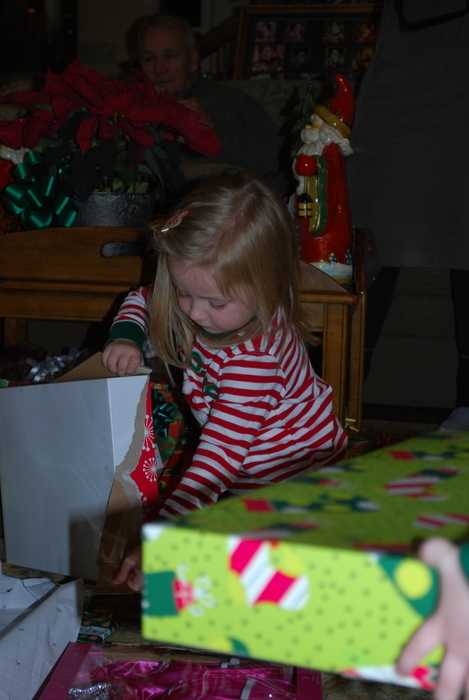 She asked us a million billion gazillion times, “Can we open presents yet?” Once everyone arrived, we ate dinner and we let the crazy begin. As always, wish I had taken more pics. We all got a kickin’ new pair of Bogs, and the are awesome!! But, Cole took his love for his new boots to the next level. He LOVES them and will NOT take them off! They are a little big for him so he can wear them for the next year or two. 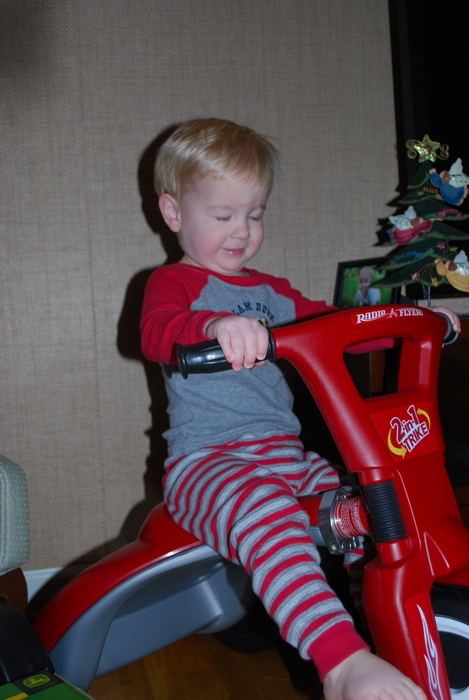 He’s having a little trouble maneuvering in them, and he falls down/trips quite often, but it’s hilarious. Also, Cole’s are camouflage. It makes it even funnier. We’ve been joking that he looks like a true Tipton Countian wearing them. 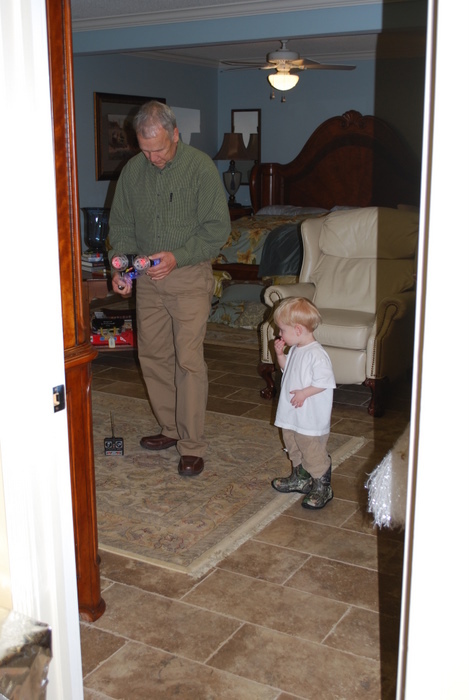 I love Papa Rod and Cole working with the remote control car…. 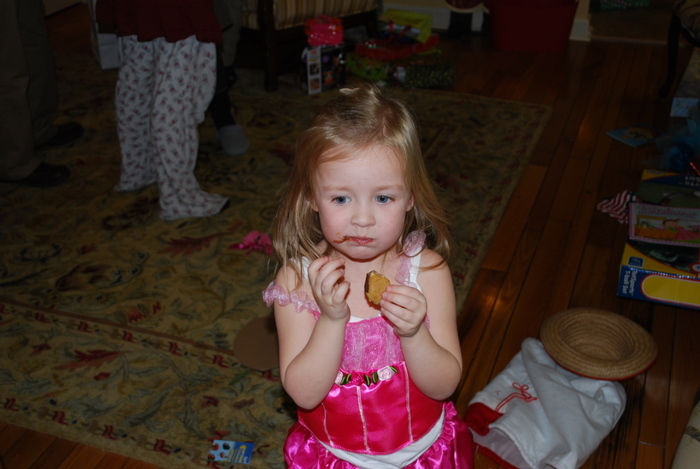 Chloe dressed in her new ballerina clothes Mize gave her and took a dessert break. We all love the next pic of Dad. So good! 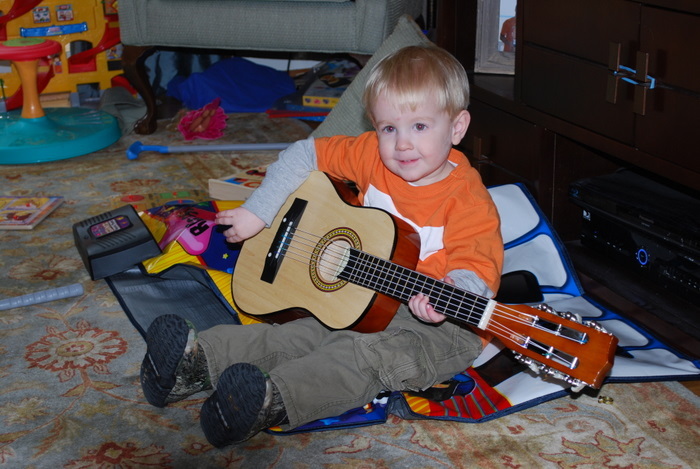 Cole’s second favorite present – a new guitar just his size!! 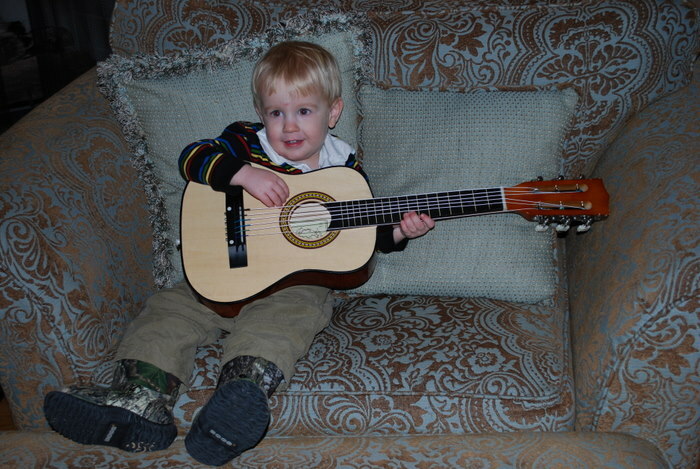 He always plays Matt’s guitar, so when Mom asked for a gift idea for him, I told her a guitar. 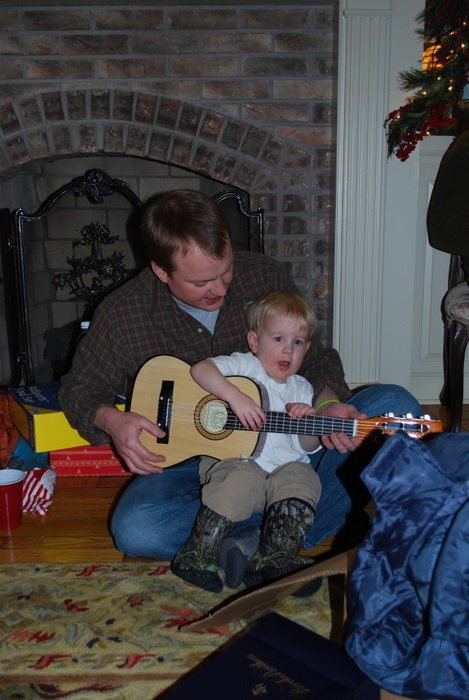 If I had known how much he would love that guitar, I would have gotten him one a loooong time ago! 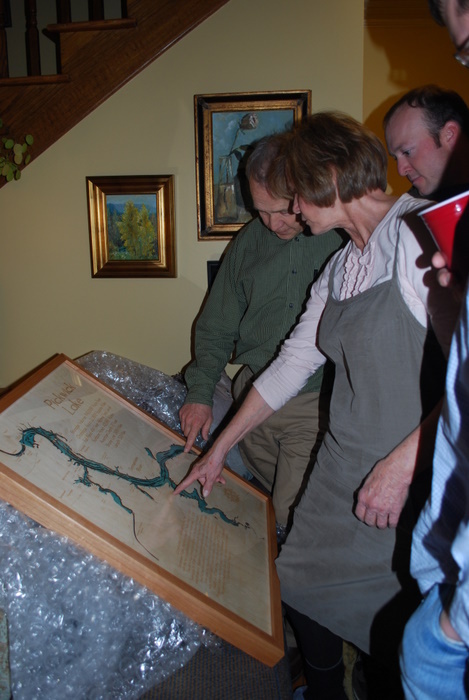 Mom and Dad opening their present from all of us…. 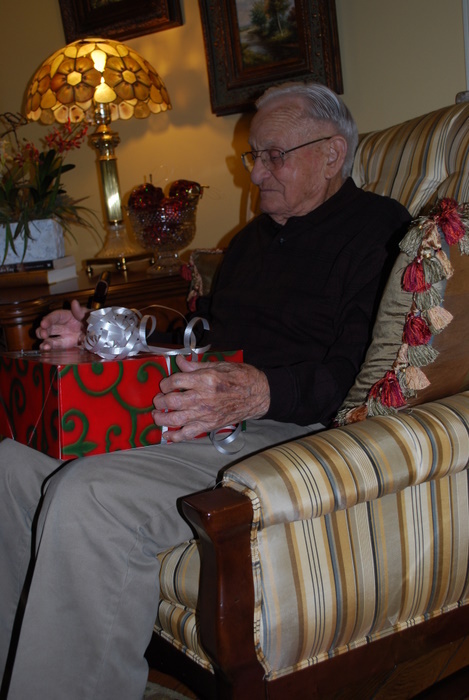 Sweet Mize again…. 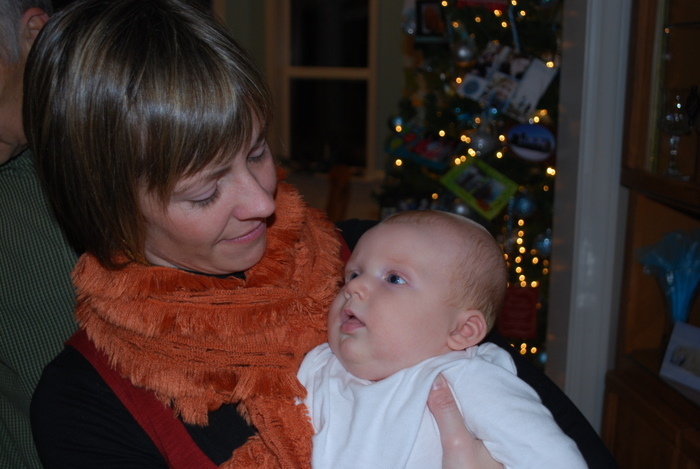 and a very, very tired, sweet Mize. It was a fun night and ended up being a very late night. Since the kids didn’t sleep on the way (or sleep much), they were absolutely worn out. It was after 10:30 before we got them to bed, so they went right to sleep. 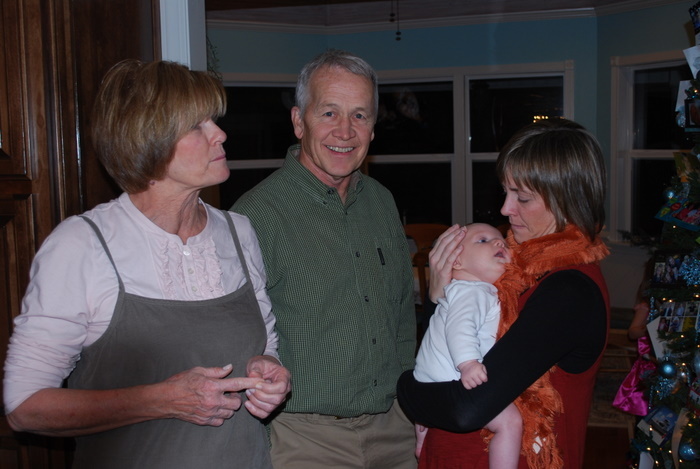 Dad went to bed when the kids went to bed, but Mom, Aus, Dana, A. D., Matt and I stayed up until after 1:30 talking. Wow! We had a good talk about the last year and a half and how we were in much better shape than we were last Christmas. We laughed a lot and shed a few tears throughout the night. It still kinda got to us that Dad was in bed and not hanging out with us, but last year at this time, we were afraid it was Dad’s last Christmas. It really is amazing not only that Dad is here, but also that he is here and doing as well as he is. We are blessed! Merry Christmas to all! Chloe was a very good listener and walked straight into our room to wake us before going downstairs. She slept until 6:45, which is normally very early for her, but I was afraid we were going to start the day much earlier as excited as she was going to bed. 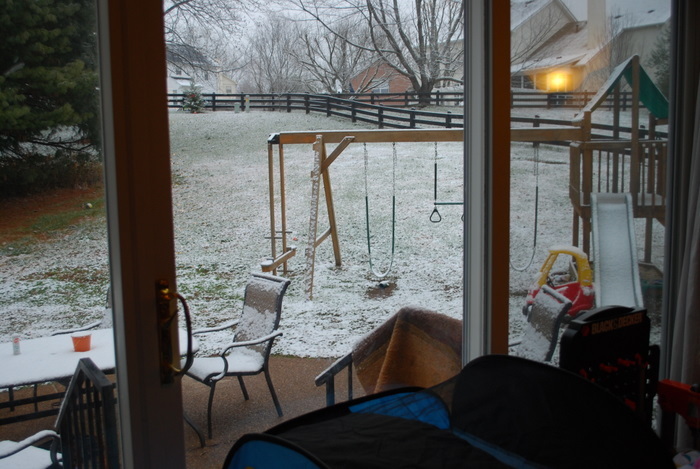 We pulled her into the bed with us, and Matt jumped up and opened the blinds….. SNOW!!! We were so excited! 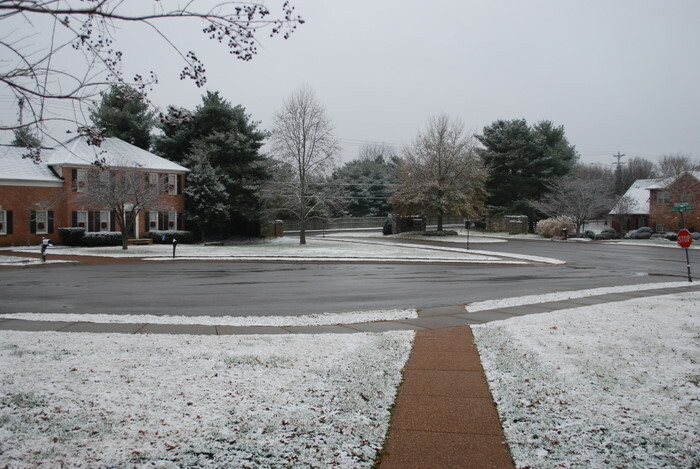 A white Christmas! We laid in bed talking and looking out the window for a little while waiting on Cole to wake up. 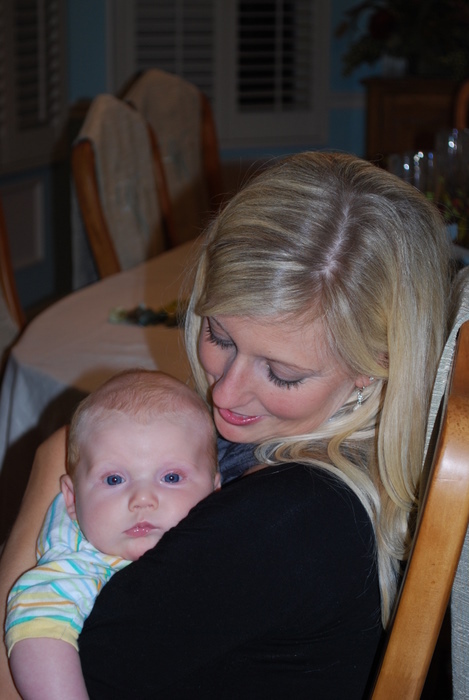 Chloe lasted about 20 minutes before we got Cole – and I thought she did great making it that long! 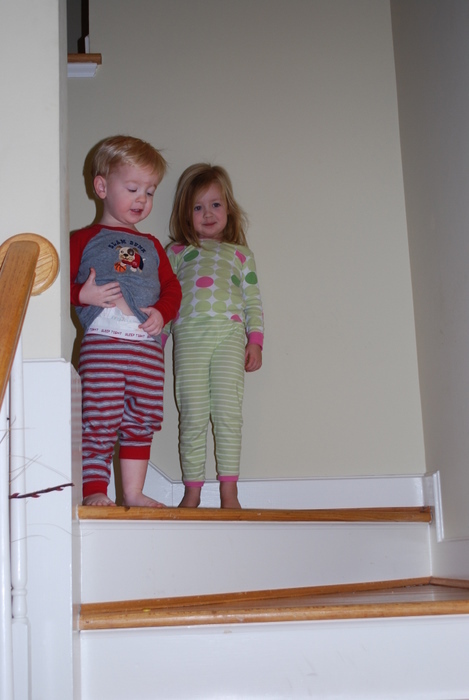 We had Chloe and Cole stand halfway down the stairs while I checked to see if Santa came and to take pics if he did. They waited very patiently…. 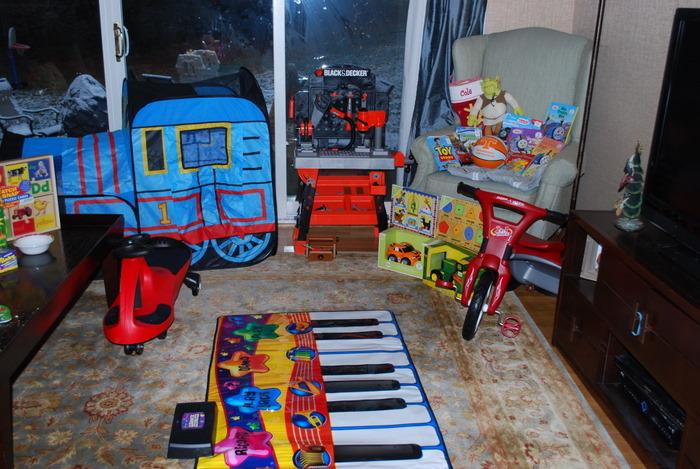 I took pics and walked back to tell them that Santa had come and left them presents. They could hardly contain themselves! 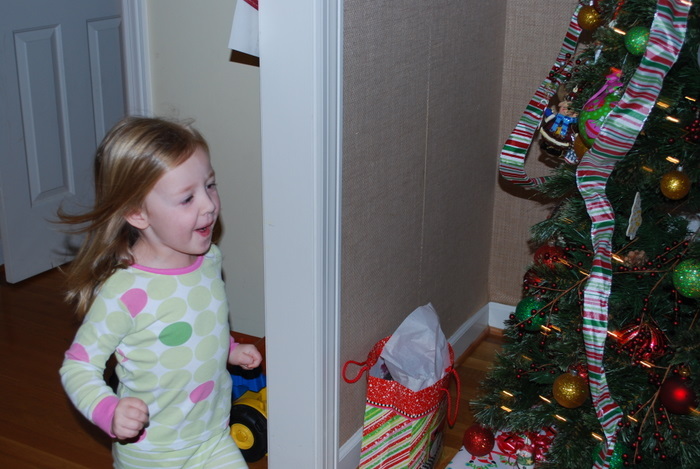 I also told them that Santa must have thought they were very good this year! Chloe running to her pile…. 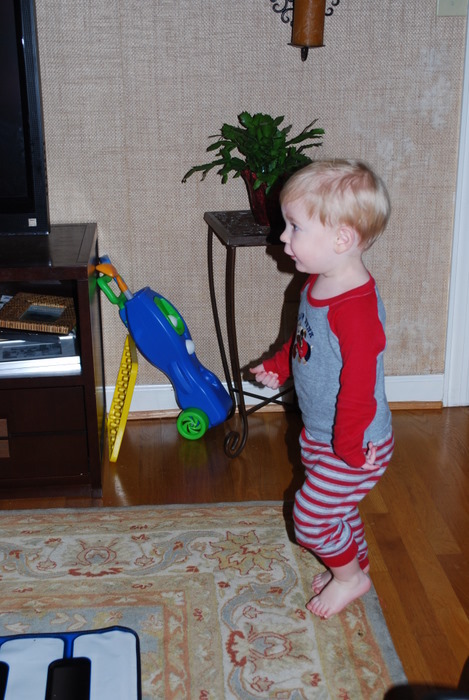 Cole running to his pile…. 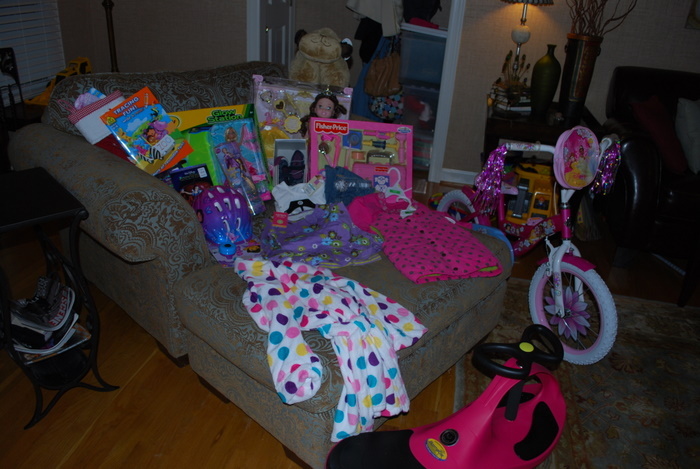 And, the pile to share…. 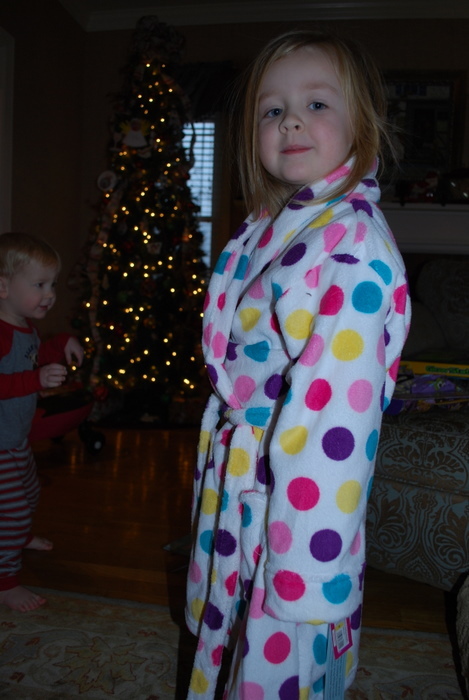 Chloe told me a while back that she wanted a “rode” (robe) like mine (because I wear one every morning); however, Chloe never told Santa she wanted a “rode.” When she saw that Santa brought her a “rode,” she quickly put it on and told me, “I didn’t even tell Santa! He just knew!” That’s because he’s magic! 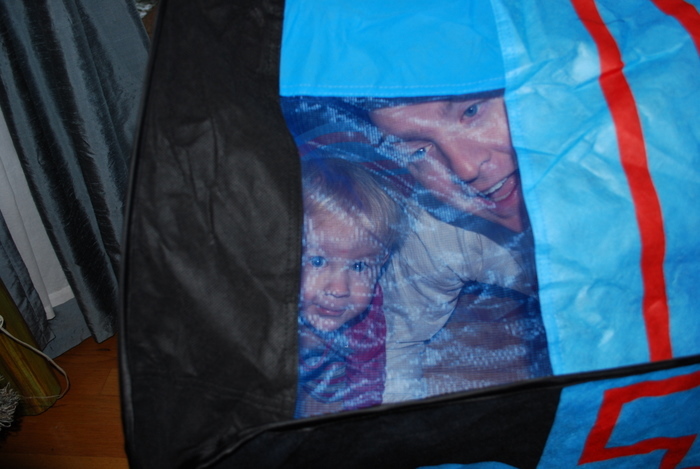 Daddy and Cole in the Thomas tent…. 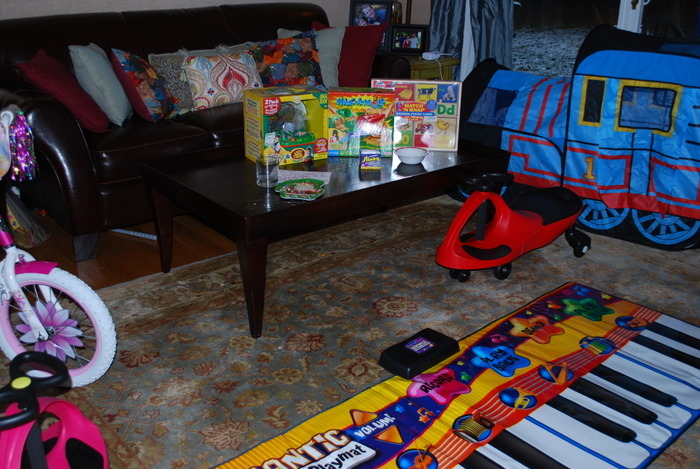 Ninnie and Big Poppa came over to see what Santa had brought, and we feasted big again! 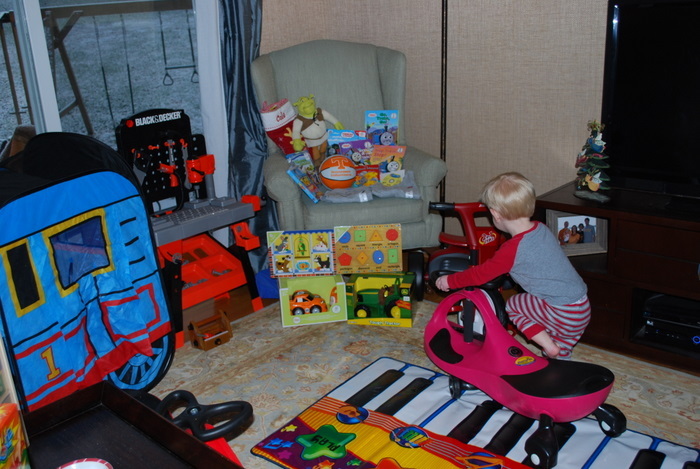 The kids played and played and played, but we couldn’t get the new riding toys out because of the weather. Ninnie helped me clean the kitchen after our big lunch, and Matt packed the car. We loaded up the kids, the presents, the DVD, and took off west hoping for the kids to nap before doing Christmas all over again! It was such a fun morning! I’m already making one of my 2011 goals to do better with taking pictures because I’m kicking myself for not taking the kids pictures tonight before church. I think I said this last year, but Christmas Eve is probably my most favorite night of the year. The entire day is exciting, and then we go to church for the most special service of the year. I love the candlelight service and singing “Silent Night.” This is the worst time that I miss my family. I’ve never missed a Christmas Eve service with my family until 2 years ago. I have so many memories of this night with my family, and I hate not being with them, but I am happy that we are continuing the tradition. I just love the service and the message. I’ve grown up knowing and listening to the story of Jesus’s birth, but now that I’m a mother, that story has even more meaning. It’s so amazing. Today was a pretty laid back day even though there was excitement in the air. Matt and I took turns running and then watching “The Grinch,” “Rudolph,” and “Shrek the Halls” with the kids. We went to Chipolte for lunch, and on the way, Chloe said, “Mom, I’m almost excited! !” And when she said this, she squealed very excitedly. For the rest of the day, she would tell us, “I’m almost excited!” Matt and I were cracking up. We awoke the kids early from nap and got them ready for church. Chloe and Cole were dressed in their Christmas clothes, and it was fun having them and Ninnie and Big Poppa sit in “big church” with us. I had a bag packed full of goldfish, fruit snacks, raisins, animal crackers, water, 2 magna doodles, and at least 10 books. I have to say, the kids did pretty well. They snacked the entire hour, but all the music and excitement kept their attention for the most part. When church was over, it was cold, dark, and SLEETING outside. Perfect! We headed to Sperry’s after church and had a great meal. Then, we told Ninnie and Big Poppa good night and headed home. 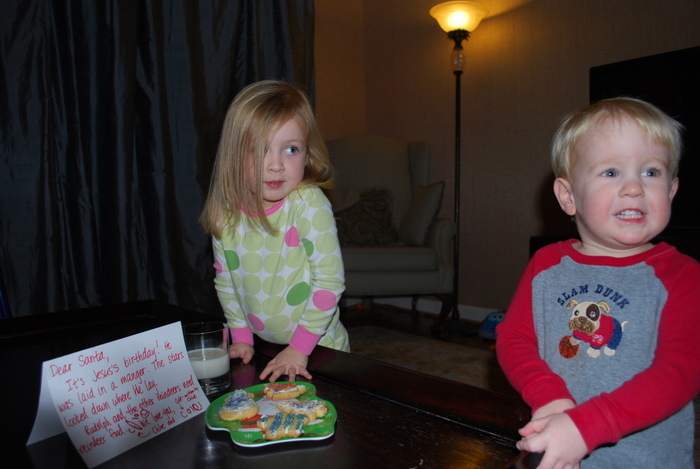 We got the kids settled down and bathed, then we went downstairs to leave Santa his cookies and milk. 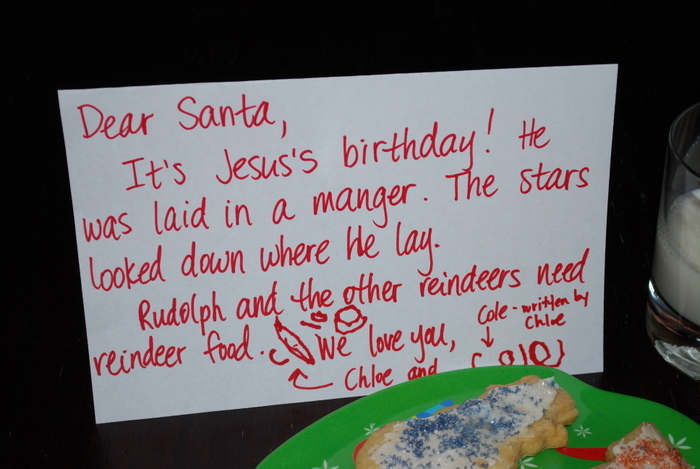 I wrote Santa’s letter, but I wrote exactly what Chloe told me to write. 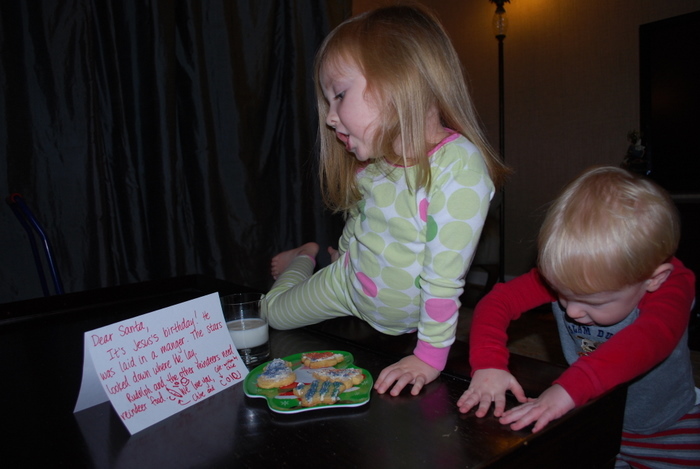 I thought she left Santa a sweet message. Then, she signed her name and Cole’s name. We all four crowded in Chloe’s bed and listened to Pappy and Papa Rod read Twas the Night Before Christmas on a book tape. Chloe and Cole were very excited and very sweet. Surprisingly, after making Chloe promise she would come in our room before going downstairs in the morning, both kids went to bed quite easily. It was a perfect ending to a perfect day!